Ashur-nasir-pal II (transliteration: Aššur-nāṣir-apli, meaning "Ashur is guardian of the heir") was king of Assyria from 883 to 859 BC. Following this victory, he advanced without opposition as far as the Mediterranean and exacted tribute from Phoenicia. On his return home, he moved his capital to the city of Kalhu (Nimrud). 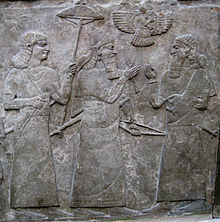 Ashurnasirpal II's father was Tukulti-Ninurta II. His son and successor was Shalmaneser III. The palaces, temples and other buildings raised by him bear witness to a considerable development of wealth and art. He was renowned for his brutality, using enslaved captives to build a new Assyrian capital at Kalhu (Nimrud) in Mesopotamia where he built many impressive monuments. He was also a shrewd administrator, who realized that he could gain greater control over his empire by installing Assyrian governors, rather than depending on local client rulers paying tribute. Like previous Assyrian monarchs Ashurnasirpal campaigned along the Euphrates against Aramaeans and in the Diyala against Babylon. Ashurnasirpal II's brutal treatment of rebels ensured that even when his army was not present, there would not be further revolts. Further revolts would see the local monarch replaced with a governor loyal only to the Assyrian monarchy. Leading his army, which was typically composed of infantry (including auxiliaries and foreigners), heavy & light cavalry and chariots, Ashurnasirpal conquered the Hittites and Aramaean states of northern Syria. Ashurnasirpal II did not destroy the Phoenician/Canaanite cities he conquered. He was unsuccessful in his siege of Tyre, which under Ittobaal settled Kition in Cyprus and opened up trade routes throughout the Aegean, at Rhodes and Miletus. Through tribute they became sources for the raw materials of his armies and his building programs. Iron was needed for weapons, Lebanese cedar for construction and gold and silver for the payment of troops. Ashurnasirpal II's palace was built and completed in 879 BC in Kalhu, which is in modern-day Iraq slightly north of Baghdad. The palace walls were lined with reliefs carved in alabaster. These reliefs bore elaborate carvings, many portraying the king surrounded by winged protective spirits, or engaged in hunting or on campaign. Each also had text inscribed in it. This text was the same or very similar on each relief and is therefore called the Standard Inscription. The Standard Inscription begins by tracing Ashur-nasir-pal II's lineage back three generations and recounts his military victories, defines the boundaries of his empire, tells how he founded Kalhu, and built the palace. Ashurnasirpal II also built a massive gateway at Nimrud. The British archaeologist A.H. Layard excavated Kalhu in the 1840s, uncovering the North-West Palace of Ashurnasirpal II. Today, many of the reliefs and sculptures from the excavations in Nimrud are displayed in the galleries of the British Museum, London, including the Statue of Ashurnasirpal II and the Black Obelisk, with other reliefs on display in museums in Europe (e.g. Munich), Japan and the USA. On this relief from Nimrud, a winged benevolent spirit blesses either the king or palace with a pine-cone. Walters Art Museum, Baltimore. After Assyria fell in 612 BC, the palace became overgrown and eventually completely buried, in which state it remained for nearly 2,500 years until rediscovered by the British born Austen Henry Layard in 1845. 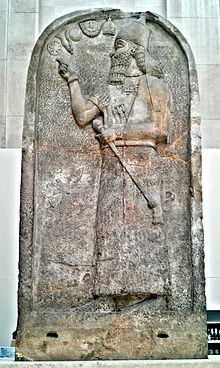 Layard oversaw the excavation of the palace during which time the reliefs that dominated the walls of the structure were removed from the site and sent to collections throughout Europe and North America, with the British Museum receiving the majority of these Nimrud reliefs. Despite excavating and removing many of these reliefs, a great number remained within the palace and were eventually reburied with time. In 1949 M.E.L. Mallowan re-excavated the site, which lasted until 1957, at which time the project was taken over by the Iraq Department of Antiques which still remains in control of the site. The known area of the palace measures 200m from north to south and 120 meters from east to west. This is most likely only a portion of the original design, including the possibility of an upper level while no concrete evidence of this remains. All of the walls of the palace were lined with stone slabs of which a majority were decorated with relief images. Among these relief images occurred a certain amount of standardization around 870 BC. Carved into each of the stone slabs, including the ones lacking relief, was what is referred to as the Standard Inscription. This text gave the various names and titles of the king, spoke of his relationship with the gods and summarized his military conquests. The text also goes on to describe the founding of Kalhu and speaks of the palace itself. The slabs, which contain relief, consist of depictions of Assurnasirpal's royal ideology. This ideology can be categorized into four main ideas, the military success of the king, his service to the gods, which provided divine protection and Assyrian prosperity. There is a particular interest in the anatomy of both humans and animals within the depictions. Royal hunting scenes are some of the most well known of the Nimrud reliefs particularly those showing Assurnasirpal II hunting lions. There is also a distinct interest in the relationship between man and animal in many of the scenes. In several depictions the king is shown with supernatural creatures of animal and human combination. All of the apotropaic portrayals, which would have decorated the doorways of the palace, were of these human and animal hybrids. Within the context of these apotropaic figures were three main types, a winged figure wearing the horned crown which symbolized divinity, a winged figure wearing a headband of rosettes and a winged human figure with the head of a bird. Other popular themes in the Nimrud reliefs included military campaigns and victories garnered by the Assyrians. More specifically these were displays of the relationships between Assyrians and non-Assyrians. The Assyrians were always shown in moments of glory while the non-Assyrians are in sprawled or contorted positions and most often naked. These illustrations represented violent death as punishment for violating Assyrian values, as well as merciless punishment for transgressions. Not only would this have served as a clear message for visiting dignitaries from other cultures but also the same message was innately obvious as a warning to the Assyrian elites as to what could happen if they decided to defy the king. Non-elites were likely not viewing these reliefs in that they would not have often, if ever, been permitted into the palace. The elites would have typically only been present at the palace for rituals and other business with the king. Assyrian women tend to be absent from all of these relief sculptures. This is most likely due to the context of the reliefs, which were male dominated activities. The only exception to women being absent from these scenes would be in the case of non-Assyrian women who were captured as slaves during war. These were typically the elite women of other cultures rather than the lower class. In contrast to the way in which male captives were portrayed, women were neither bound nor naked in their depictions. Women captives were most often shown in floor length outfits with possibly one part of their body exposed in detail. Not all of the relief sculptures have been removed from the palace at Nimrud, with many of them still able to be viewed in their original context although this is greatly limited. Many of the museums, which currently display the Nimrud reliefs, attempt to recreate the palace atmosphere by exhibiting them in a similar fashion to their original loci. In November 2014, it was reported that ISIL (Islamic State of Iraq and the Levant) militants had looted many of Iraq's archaeological sites, including the palace of Ashurnasirpal II, and are selling artifacts on the black market. According to Aymen Jawad, executive director of Iraq Heritage (based in London), "Tablets, manuscripts and cuneiforms are the most common artifacts being traded, and, unfortunately, this is being seen in Europe and America,” he says. “Hundreds of millions of dollars’ worth of irreplaceable pieces are being sold to fund terrorists." On 5 March 2015 ISIL reportedly started the demolition of Nimrud. The local palace was bulldozed, while lamassu statues at the gates of the palace of Ashurnasirpal II were smashed. ^ Roux, Georges (1992). Ancient Iraq (Third ed.). New York: Penguin Books. p. 288. ISBN 0-14-012523-X. ^ Clare, Israel; Tyler, Moses (1897). Library of Universal History Vol 1 - Ancient Oriental Nations. New York: R.S. Peale J.A. Hill. p. 151. Retrieved 22 February 2018. ^ Healy, Mark (1991). The Ancient Assyrians. New York: Osprey. p. 10. ^ a b c d e Russell, John Malcolm (1998). "The Program of the Palace of Assurnasirpal II at Nimrud: Issues in the Research and Presentation of Assyrian Art". American Journal of Archaeology. 102 (4). pp. 655–715. ^ Ataç, Mehmet-Ali (2010). The Mythology of Kingship in Neo-Assyrian Art. New York, NY: Cambridge University Press. ^ a b c d Cirfarelli, Megan (1998). "Gesture and Alterity in the Art of Ashurnasirpal II of Assyria". The Art Bulletin. 80 (2). pp. 210–228. ^ Janine Di Giovanni; Leah McGrath Goodman; Damien Sharkov (November 6, 2014). "How Does ISIS Fund Its Reign of Terror?". News Week. Retrieved January 21, 2015. Brinkman, J.A. (1968). A Political History of Post-Kassite Babylonia, 1158–722 BC. Rome: Pontilicium Institutum Biblicum. Grayson, A. K. (1972). From Tiglath-pileser I to Ashur-nasir-apli II. Assyrian Royal Inscriptions. 2. Wiesbaden: Otto Harrassowitz. Mallowan, M.E. L. (1966). Nimrud and Its Remains. London: Collins. Olmstead, A. T. (1918). "The Calculated Frightfulness of Ashur Nasir Apal". Journal of the American Oriental Society. 38: 209–263. doi:10.2307/592609. Reade, J.E. (1980) . "Assyrian Architectural Decoration". Baghdader Mitteilungen. 10/11: 71–87. Stearns, J. B. (1961). Reliefs from the Palace of Ashurnasirpal II. Graz: Ernst F. Weidner. Wikimedia Commons has media related to Ashurnasirpal II.